The Great Himalayan National Park (GHNP) officially known as the Jawaharlal Nehru Great Himalayan National Park is India's richest biodiversity spot in the western Himalayas. Situated in Kullu district of Himachal Pradesh State, the park was notified in 1986 and formally declared a National Park under the Wildlife (Protection Act), 1972, by the Himachal Pradesh government in 1999 to save the endangered wildlife species of this Himalayan ecosystem. Recently, The World Heritage Committee has included the Great Himalayan National Park Conservation Area (GHNPCA) on the World Heritage List on the basis of criterion (x) of UNESCO Guidelines on 22 June 2014. The GHNP has now come in the league of Indian World Heritage Sites (WHS) such as the Taj Mahal, Ellora, Kaziranga National Park, Keoladeo National Park, Manas National Park, Nandadevi Biosphere Reserve and the Sunderbans. The Great Himalayan National Park Conservation Area has GHNP (754.4 sq km), Sainj (90 sq km) and Tirthan (61 sq km) Wildlife Sanctuaries. The 905.40 sq km GHNPCA includes the upper mountain glacial and snow melt water source origins of the westerly flowing JiwaNal, Sainj and Tirthan Rivers and the north-westerly flowing Parvati River. Many beautiful trails lie within these rivers. The altitude of the area ranges from 1,800 metres to 5,200 metres with a major part of the GHNP lying above 4,000 metres. Bounded by the towering peaks of the Himalayas on three sides with an entrance from the west, the park lies in the Sainj Forest Division. The park is home to several rare and threatened species, including the western tragopan, chir pheasant, snow leopard, Himalayan musk deer, Asiatic black bear, Himalayan tahr, blue sheep and serow. Some 25 threatened IUCN Red-listed plant species are also recorded in the park. According to Wildlife officials, the Park is one of the two national parks in the world that is home to the brilliantly plumaged western tragopan. The Machiara National Park in Pakistan also supports this species. Another endangered pheasant, the cheer, is also found in the GHNPCA's grassy slopes. Other pheasant species, the monal and the koklas, are in abundance in the temperate zone, while the kaleej occurs in small numbers below 2,000 m.
Special permits from the Park Director at Shamsi or the range officers at Larji, Sairopa, Banjar or Sainj are required by tourists for entrance to the Great Himalayan National Park. No vehicle is allowed inside the park. Visitors has to go on foot accompanied by Guides which is compulsory and the entrance is allowed only between sunrise and sunset. There is no entry fee for trekking in the eco-zones but for the GHNP, Indians have to pay Rs.50 per day and foreigners Rs.200. One can enjoy adventure activities such as rappeling, river crossing and small treks, living in tents at mountain plateau etc. It is an ideal getaway for professional trekkers as it takes one from an altitude of 1,700 m to 5,800 m. Every year over 20,000 trekkers, mainly from European countries, Maharashtra, Gujarat, Delhi and Karnataka visit the park from especially during May to October. More than 50 travel agents mostly based in Sai Ropa in Banjar tehsil for conducting activities in mountaineering, backpacking, skiing, trekking and rafting for students, families and corporates. The boundaries of GHNP are connected to the Pin Valley National Park, the Rupi-Bhawa Wildlife Sanctuary and the Kanawar Wildlife Sanctuary. The valleys such as Tirthan, Sainj, Jiwa Nal and Parvati offer moderate to strenuous treks. The Jiwa Nala-Parvati river valley 110-km trek is a seven-day hike, crossing the passes at Kandi Galu (3,627 m) and Phangchi Galu (4,636 m). Likewise, the Pin Parvati pass (5,319 m) via Pulga is 90 km and requires eight days. Another popular trek is through the beautiful wilderness is to Rakte Sar, the origin of the Sainj river. There are 14 inspection huts inside the park where the trekkers can camp.The Forests Department provides camping equipment and guides. The trails in the eco-zone go through villages and are generally easy to moderate. The treks also offer an opportunity to interact with the villagers and observe their daily activities, including weaving, basket making, cooking and farming. The eco-zone contains 160 tiny villages with a population of about 15,000. 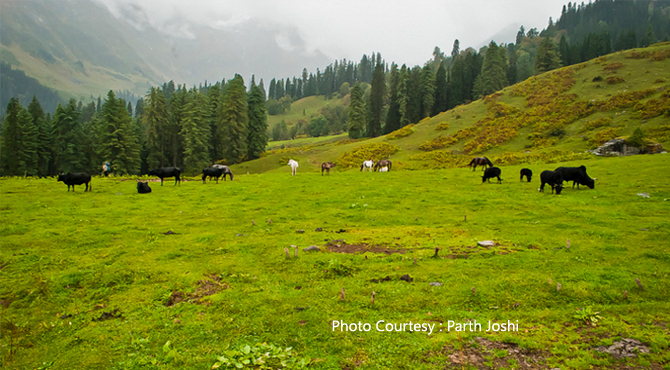 During the trekking, one gets the opportunity to spot a wide range of western Himalayan biodiversity. It is advisable to stick to the best season from September to November / April to June as the winters are too cold and the monsoons bring in landslides and muddy trails. April is great for birding. May to June and mid-September to end October are ideal for trekking. For wildlife sightings, late October and November are best. A total of 832 plant species, representing 128 families and 427 genera, which cover 26 per cent of the total flora of Himachal Pradesh, have been recorded in the GHNP. It is also home to a number of threatened species, providing them with habitats critical to their survival. It supports self-sustaining populations of near-threatened, vulnerable and endangered species like leopard, Himalayan Black Bear, Royle’s Vole, Himalayan serow, Himalayan goral, Himalayan musk deer, western tragopan, cheer pheasant and the Himalayan tahr, a wild goat that lives on the steepest cliffs. The endangered snow leopard and the critically endangered Red-headed vulture are also present. The park is also home to a large number of small mammals. They include the giant Indian flying squirrel, a nocturnal animal that roosts in tree hollows, the Indian pika, also known as mouse hare, the porcupine, the royle's mountain vole and the Himalayan palm civet. The birds both indigenous and migrant variety are also found. The vegetation here ranges from deciduous forests of blue pine and cedar, oak and bamboo and grass meadows covered with wild flowers. There are a numerous number of plant varieties which are rare and having medicinal values. Deodar tree surround the entire area which provides shelter for some of the nearly extinct species of animals also. It has also been identified as one of the five centres of plant diversity and endemism in India by the World Conservation Monitoring Center.